The element /package/components describes software components contained in the Pack. A component lists the files that belong to a component and that are relevant for a project. The component itself or each individual file may refer to a condition that must resolve to true; if it is false the component or file is not applicable in the given context. Each component must have a Class (Cclass=), a Group (Cgroup=), and a Version (Cversion=) which is used to identify the component. Optionally a component may have a Sub-Group (Csub=) and Variant (Cvariant=) to add further categories. The Class, Group, Sub-Group, Variant and Version is used together with the vendor specified by the Pack, to identify a component. A component vendor must ensure that the combination Class, Group, Sub-Group and Version is unique and not used by multiple components. In case multiple inter-dependent components that belong to the same Cclass form part of a solution, these can be grouped into a bundle. A bundle specifies identical attributes Cclass, Cversion and optionally Cgroup and Cvendor for several components. Components within a bundle inherit these attributes set by the bundle and cannot alter these attributes. Bundles ensure consistency of attributes across multiple interworking components and restrict the mix and match of components within a Cclass from different Software Packs. 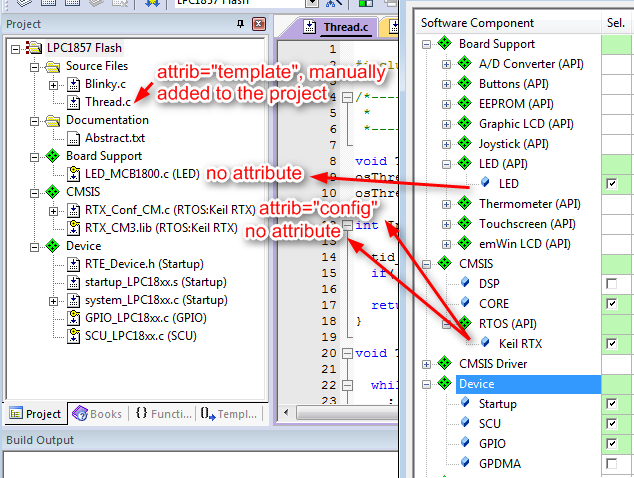 An example of a bundle is shown in the Create a BSP Bundle section where the bundle is used to deliver board support files for a certain development platform. Libraries, source, and header files without an attribute cannot be modified. These files are stored in the folders of the Software Component and get directly included from this location into the project. Source and header files that have the attribute "config" are copied to the project so that they can be edited by the user and tailored to the needs of the application. If a Software Component allows multiple instances of files, they can be copied multiple times to a project and will get a suffix _%Instance% (see Component Instances). Please note that header files that are used with the attribute "config" need to be stored separately from other header files (for example in an extra directory) to avoid that due to the include path search order of the compiler, the unmodified header file in the pack repository is found first and used by the compiler (creating unexpected results). Source and header files that have the attribute "template" are part of User Code Templates and can be added to a project manually by the user. Modern microcontrollers often have multiple instances of the same peripheral interface (for example UART, SPI, USB, etc.). To be able to have separate configuration files for each of these instances, Software Components can have multiple instances as well. The attribute maxInstances declares the maximum number of instances that can be used in a project for a certain Software Component. 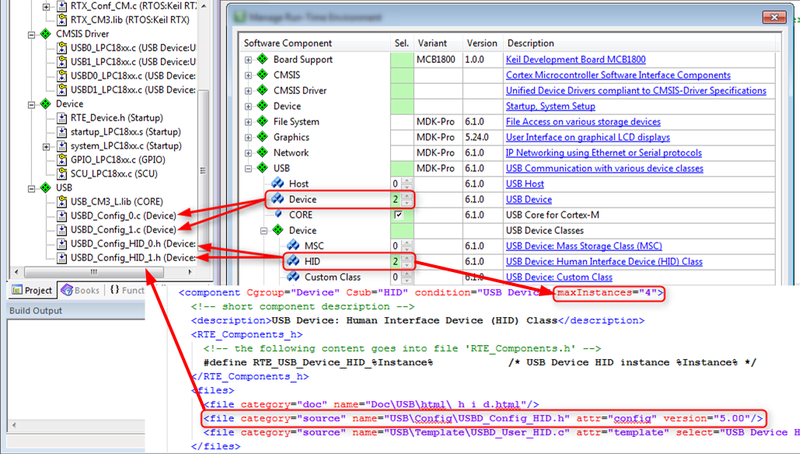 The statements of the related <RTE_Components_h> element for all selected software components. The header file name specified in the <compile> element of the /package/devices element. The following example shows a sample content of a file RTE_Components.h. It contains the statements that are specified with the element RTE_Components_h of four software components. The RTE_Components.h file allows to create software that works with any supported device as it gives access to the CMSIS_device_header. The CMSIS_device_header reflects the current selected device and gives you for example access to the processor configuration. Refer to "Device Header File <device.h>" in CMSIS-Core(M) or CMSIS-Core(A) for more information. #error "Software Component requires a device with MPU"
Another typical usage of the RTE_Components.h file is in header files to control for example the inclusion of files that are related to other components for the same Software Pack. The build environment shall generate a C/C++ header file with the name Pre_Include_Global.h from all selected components and add this file to the command line as a pre-include file for the build of all modules in the project. Note: the file shall be generated into the RTE/<target> subdirectory. No need to explicitly include this file as it is automatically added as pre-include into the build for all modules. The build environment shall generate a C/C++ header file with the name Pre_Include_<Cclass>_<component>.h from the selected component and add this file to the command line as a pre-include file for the build of all modules of this component. The same is done for each component containing a "Pre_Include_Local_h" element. Note: files shall be generated into the RTE/<target> subdirectory. No need to explicitly include this file as it is automatically added as pre-include into the build for all modules of component Other:Alpha. Grouping element containing a choice of at least one bundle or component. No more than one element components can exist in a Pack. A bundle describes a named collection of inter-operable components of the identical Cvendor, Cclass and Cversion. Components enclosed in a bundle must not specify any of the following attributes Cvendor, Cclass and Cversion. A component describes a collection of files (source, header, configuration, library) that can be versioned and categorized. Cvendor Defines the component vendor this component is shipped by. It is a mandatory part of the component ID and will be inherited from the package vendor if not specified. Cclass Defines the component class to which the component belongs. This is a mandatory part of the component ID. Predefined values can be used as listed in the table Component Classes. Cversion Defines the version of this component. Is a mandatory part of the component ID. The version format is described in Version Type. Component Subgroups are specified by the element Csub, and create subcategories within Component Classes (Cclass) and Component Groups (Cgroup). A Csub name is of type xs:string with a length between 3 and 32 characters. No Csub names have been predefined. The group files can appear in various Pack elements. This group is the frame for defining individual file properties. The element file is the mechanism to attach files to the software. The file purpose is defined through the category attribute. The name attribute identifies the file. The file attribute defines the special handling in the project when being used as configuration, template, or interface file. The table lists the values available as a file attribute. The file is used as a source code template file. It is expected to be edited and extended by the software developer. The file can be copied into a user section of the project. Config files are copied into the project folder and are adopted specifically for that project. Due to the include path search order of the compiler, chances exist that the unmodified header file in the pack repository is found first and used by the compiler (creating unexpected results). File category types define the use of component files within the application. Typically, these files are added to the project and processed by the build tools. The table lists the predefined values for a file category. include Sets an include file path. Note: ensure that the name attribute specifies a directory and ends with a '/'. image Files of image type are marked for special processing into a File System Image embedded into the application. This category requires the attr being set to template. preIncludeGlobal The specified file is added as a pre-include file to the compiler command line for all modules of the whole project (globally). preIncludeLocal The specified file is added as a pre-include file to the compiler command line for all modules of the component (locally).